A new website launched today will enable industry and community stakeholders to provide their feedback on the draft Australian Beef Sustainability Framework. What is sustainable beef production in Australia? For the first time, that question now has a clearly defined answer. After 12 months of work, including wide-ranging consultation with industry and the broader community, an 11-member Sustainability Steering Group has today released Australia’s first Beef Sustainability Framework. The draft document will be open for industry and public feedback via a new website until the end of February – click here to view – with the final document to be formally launched in March. However the document won’t be final in the true sense of the word. It is intended to be a living document open to continual review and adjustment by an industry committee in response to changing sustainability issues in future. 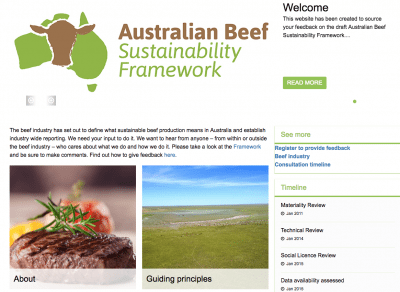 The framework is designed to enable the Australian beef industry to measure its performance on a range of sustainability measures, and to communicate that performance to the broader community. The draft framework contains 31 individual indicators covering environmental management, animal welfare, social and economic sustainability factors. The document ties in with the objectives of the Meat Industry Strategic Plan 2020, released last year. It has been coordinated by the Red Meat Advisory Council and funded by Meat & Livestock Australia. When moves to develop a sustainability framework for the global beef industry began six years ago, it triggered a debate in the Australian cattle industry about the prospect of expensive and burdensome on-farm certification systems being imposed on Australian cattle producers. The Nationals also became involved, speaking out against handing decision making powers in any framework development to groups such as the World Wildlife Fund, which had campaigned actively for decades for stringent Government controls over landholder activities in Australia. That debate resulted in the Australian cattle industry opting not to join other beef producing countries in creating a Global Beef Sustainability Framework (that work is also progressing – see the GRSB website here) , but to create its own sustainability framework. The process has since involved consulting with a diverse range of industry and external stakeholder groups, but with an industry committee making the final decision on the direction and content of the final framework. 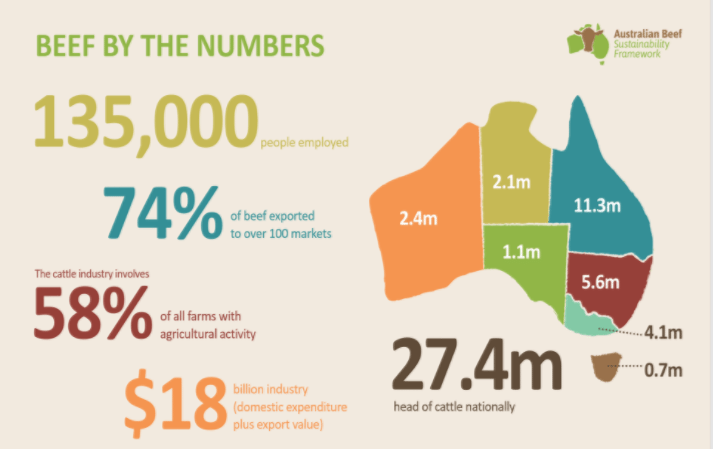 A snapshot of the Australian beef industry from the Australian Beef Sustainability Framework. Click to view in larger format. The framework released today draws on 40 sources of industry-level data to measure the industry’s commitment to sustainability, and does not impose additional cost or targets at an individual farm level. Red Meat Advisory Council (RMAC) chair Don Mackay said the draft was developed following discussions with industry, retailers, regulators, financial organisations, special interest groups and customers. “We now want all members of the beef value chain – from producers to consumers – to help us define what sustainable Australian beef means; and how we measure and report this to the wider community,” Mr Mackay said. “We wish to paint a clear and honest picture of sustainable beef in Australia and how we are responding to changing demands within the community to position our industry for the future,” says Mr Mackay. SSG chair Prue Bondfield said the draft Framework identified key priority areas and potential measures. “It’s now open to the industry and the community to comment on whether the areas identified to date are the right ones,” Ms Bondfield says. Source: RMAC. Open consultation via an online platform runs for six weeks from January 11 to February 17, 2017. 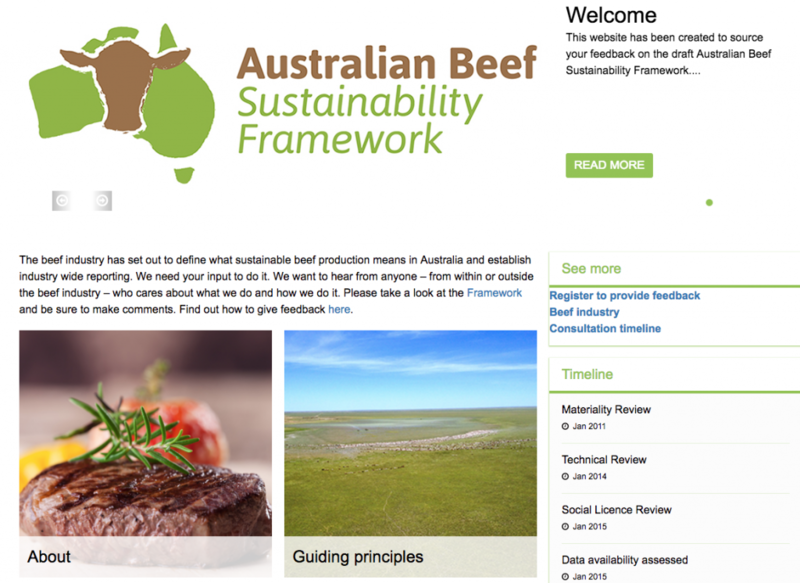 Visit http://www.sustainableaustralianbeef.com.au/ to join the conversation and offer feedback on the draft Framework. Nature and natural processes have proven to be sustainable for tens of thousands of years, Paul D Butler? What about human intervention? It’s not hard to point to long-term over-grazing ‘hot spots’ in areas like Charters Towers – all man-made. Nature needs a hand, it seems, and projects like this are likely to be part of the solution. Great to see: and a fantastic first step! Now all that needs to happen as part of this process is to embrace totally the concept of holistic grazing and farming techniques; and start getting paid for taking carbon and methane out of the atmosphere! There must surely be a valuation premium available to those that can procure a cash-flow for doing so: and I would suggest that it is either Government and/or Industry. The first to meet targets, and the second as an off-setting mechanism . Once you accept the idea that beef production is not sustainable or that you need to prove beef production sustainability…….you have lost the battle. Nature and natural processes have been proven to be sustainable for tens of thousands of years……….why would we accept that certain men have decided otherwise?